We have locations in Tennessee, Ohio and Florida. All of our stores offer the best promotion on boots you will find anywhere...Always Buy One Pair, Get Two Pair Free! More than forty years ago the original store was opened, just across the street from where we are today. The location may have changed, but the concept of great product selection and excellent customer service is the reason we have so many return customers as well as first time shoppers. Our community is one of many different cultures and professions. The new gas and oil industry boom has brought workers from all over the United States and even Europe to the store. They are always impressed with the sheer quantity and size selection of work boots, western boots, fashion, hiking and motorcycle boots. We carry national brands such as Rocky, Justin, Lucchese, Ariat, Wolverine, J.B. Dillon, Masterson, Santa Fe, Sterling River and more. You’ll find boots for the entire family with men’s sizes 6 to 16 including hard to find widths and ladies sizes 5-12 including wide widths and big selection of children’s boots. Let our knowledgeable sales staff help you find the perfect fit. We look forward to making your shopping experience something you'll always remember. Come on in and see how much fun it can be to Buy One Pair, Get Two Pair Free! At Boot Country in Nashville you'll get a big ole welcome y'all and become part of the Boot Country family as soon as you walk in the door. We pride ourselves on customer service and of course great boots. Boot Country’s staff makes sure that our extended customer family leave with a smile. We have over 20,000 boots in stock and carry national brands such as Rocky, Justin, Lucchese, Ariat, Wolverine, J.B. Dillon, Masterson, Santa Fe, Sterling River and more. You’ll find boots for the entire family with men’s sizes 6 to 16 including hard to find widths and ladies sizes 5-12 including wide widths and big selection of children’s boots! Find out what true southern hospitality is! You’ll want to come back to add to your boot collection and see just what your Boot Country family is up to! Buy One Pair, Get Two Pair Free! Our newest store, located in Nashville's Opry Mills Mall, offers thousands of boots to choose from with national brands such as Rocky, Justin, Tony Lama, Lucchese, Ariat, Wolverine, J.B. Dillon, Masterson, Georgia Boot, Santa Fe, Sterling River and more. You’ll find boots for the entire family with men’s sizes 6 to 16 including hard to find widths and ladies sizes 5-12 including wide widths and big selection of children’s boots. We carry western, work, hiking, fashion, motorcycle boots and more! As you step into Nashville Cowboy, it's almost as if you have stepped back in time. The smell of leather lingers in the air as you take in the beautiful 'ole town feel, reminiscent of days gone by. The beautiful display of boots will bring you back to present day as you begin your shopping experience. Our friendly staff will be happy to assist you in the proper fit of your boot and will be able to answer any question you may have. You’ll find thousands and thousands of boots on display with national brands such as Rocky, Justin, Lucchese, Ariat, Wolverine, J.B. Dillon, Masterson, Santa Fe, Sterling River and more. You’ll find boots for the entire family with men’s sizes 6 to 16 including hard to find widths and ladies sizes 5-12 including wide widths and big selection of children’s boots. We are conveniently located in the downtown Nashville shopping district. At Nashville Cowboy, you will get more than just boots, you will receive a special experience that you won't find anywhere else. Boot Factory Outlet is located in Pigeon Forge, Tennessee at the foothills of the Smoky Mountains just minutes from the entrance of the Smoky Mountain National Park and Gatlinburg, Tennessee. With attractions such as Dollywood, Splash Country and Dixie Stampede, Smoky Mountain National Park, Pigeon Forge and Gatlinburg are a very family friendly year-round tourist attraction. With over 20,000 pairs of boots in stock along with a fun, friendly atmosphere, Boot Factory Outlet is also a must see in Pigeon Forge! We carry national brands such as Rocky, Justin, Lucchese, Ariat, Wolverine, J.B. Dillon, Masterson, Santa Fe, Sterling River and more. You’ll find boots for the entire family with men’s sizes 6 to 16 including hard to find widths and ladies sizes 5-12 including wide widths and big selection of children’s boots. We carry western, work, hiking, fashion motorcycle boots and more! We want you to go to Dollywood, we want you to visit the Smoky Mountain National Park, as well as take the family to a great dinner show. But don’t forget to visit us to keep the fun going! Not only will you get a great deal on boots for the entire family, but you will leave our store and tell your friends and family back home about the great time you had visiting Boot Factory Outlet. Located just outside of Knoxville in Sevierville, TN. Thousands and thousands of boots to choose from with national brands such as Rocky, Justin, Lucchese, Ariat, Wolverine, J.B. Dillon, Masterson, Santa Fe, Sterling River and more. You’ll find boots for the entire family with men’s sizes 6 to 16 including hard to find widths and ladies sizes 5-12 including wide widths and big selection of children’s boots. We carry western, work, hiking, fashion, motorcycle boots and more! From the moment you set your foot in our store you will experience shopping like never before. We have qualified, knowledgeable and friendly staff eager to help you choose the right size and style for any occasion. You don't have to settle for one pair of boots! Here at Boot Factory Outlet you can walk out the door with three pairs. So come on in and let the adventure begin. Buy 1 Pair, Get Two Pair Free! Located on famous International Drive, Boot Factory Outlet thrives on selling boots buy 1 pair get two pairs free! 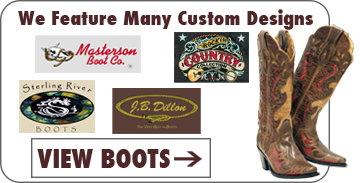 Thousands and thousands of boots to choose from with national brands such as Rocky, Justin, Lucchese, Ariat, Wolverine, J.B. Dillon, Masterson, Santa Fe, Sterling River and more. You’ll find boots for the entire family with men’s sizes 6 to 16 including hard to find widths and ladies sizes 5-12 including wide widths and big selection of children’s boots. We carry western, work, hiking, fashion, motorcycle boots and more! Located between Jacksonville and Gainesville, Boot Factory Outlet thrives on selling boots buy 1 pair get two pairs free! Thousands and thousands of boots to choose from with national brands such as Rocky, Justin, Lucchese, Ariat, Wolverine, J.B. Dillon, Masterson, Santa Fe, Sterling River and more. You’ll find boots for the entire family with men’s sizes 6 to 16 including hard to find widths and ladies sizes 5-12 including wide widths and big selection of children’s boots. We carry western, work, hiking, fashion, motorcycle boots and more!